A scheme of sanctioning loans up to Rs 1 crore in 59 minutes has been launched recently. The loan limit on this scheme has also been increased significantly from what was being approved previously. 1% exemption on interest rate on overdraft- Enterprises that have MSME Registration can avail benefit of 1% exemption on interest rate on OD as mentioned in the scheme. This is available to MSMEs in most of the nationalised banks. The requirement of sourcing from SMEs by Government enterprises has been increased to 25%. Of this, the material to the extent of at least 3% will be sourced from women-owned SMEs. GST exemptions for small manufacturers and service providers such as industrial consultants, engineering consultants etc.. doubled from Rs 20 lakh to Rs 40 lakh. 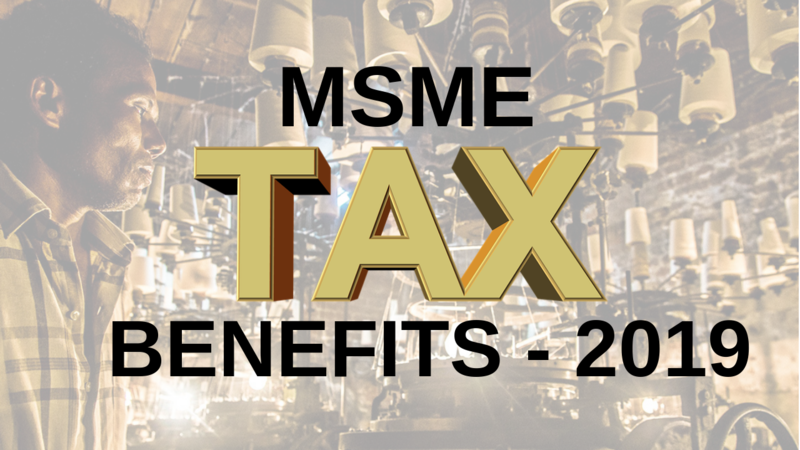 Enterprises that have MSME Registration in the manufacturing sector are eligible for Industrial Promotion Subsidy as may be prescribed by the government in this behalf. Threshold limit for presumptive taxation of business was raised from Rs 1 crore to Rs 2 crore. The benefit of presumptive taxation was extended for the first time to small professionals fixing threshold limit at Rs 50 lakh. The tax rate for companies with turnover of up to Rs 250 crore, covering almost 99% of the companies, was reduced to 25% which was also applicable to new manufacturing companies without any turnover limits. To promote “Make in India” the duties on 36 capital goods is abolished. Small manufacturing companies can now use the composition scheme and pay GST at 6% instead of 18%.